With their choice in soft or hardwood timbers, our premium Needham gates have attractive curved tops, diagonal bracing and strong vertical timbers. 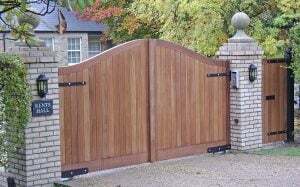 Built to the highest quality, they are a strong and durable option for your entrance gates. Our bespoke Needham gates are built to your own specification, and measurements, making them a perfect fit for your entrance. All our Needham bespoke gates take between 3-5 weeks to be built and delivered. To order your Needham entrance gates please fill in the contact form and we will contact you to discuss your requirements further.